This website was created as partial fulfillment of the project requirements of the course EEL6503: Spread Spectrum and CDMA. I took this course in the fall of 2001. The instructor for the course was Dr.T. F.Wong. One of the requirements of the course was to work on a project which involved the simulative study of algorithms and systems relevant to the course. This page is the result of around 3 weeks of sleepless nights, cold dinners and missing Friends' re-runs that took to complete this project. My project was a study on linear and adaptive linear multiuser detection algorithms. I compiled a short tutorial level introduction to this interesting topic. Hope you enjoy going through the tutorial. All the contents of this page are for the sole purpose of the class project. All the graphs presented in this tutorial were obtained from my MATLAB code. If you feel that I have violated your copyright, email me and I will remove the corresponding content from the web page. Multiuser detection is a technology that spawned in the early 80s. It has now developed into an important, full-fledged field in multi-access communications. Multiuser Detection (MUD) is the intelligent estimation/demodulation of transmitted bits in the presence of Multiple Access Interference (MAI). MAI occurs in multi-access communication systems (CDMA/ TDMA/ FDMA) where simultaneously occurring digital streams of information interfere with each other. Conventional detectors based on the matched filter just treat the MAI as additive white gaussian noise (AWGN). However, unlike AWGN, MAI has a nice correlative structure quantified by the cross-correlation matrix of the signature sequences. Hence, detectors that take into account this correlation would perform better than the conventional matched filter-bank. 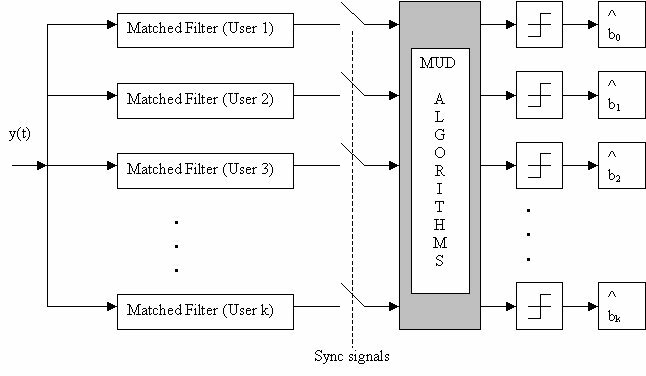 MUD is basically the design of signal processing algorithms that run in the black box shown in the figure below. These algorithms take into account the correlative structure of the MAI. To learn more about MUD technology download the tutorial from the table above. Click here for my tutorial on Low Density Parity Check (LDPC) Codes.